Merrybeth Farm Carriage Service is owned by Beth and Martin Saupe. 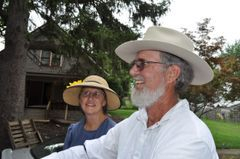 They live, along with their horses, chickens and goats, near Champaign, Illinois - just west of Bondville. They love sharing their horses with other people and will do everything they can to meet your expectations. 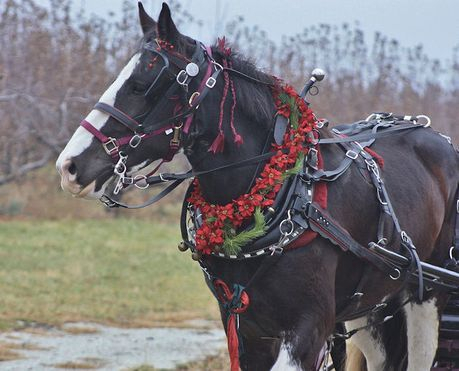 Meeting expectations isn't hard with a beautiful people-friendly Clydesdale named Jill and two Morgan horses named Rooster Cogburn and Lonesome Dove. If you're curious about the name "Merrybeth" - spelled with an "e" - well it's a good story. Beth has owned a horse since she was seven years old and she is almost never grumpy. So the name Merrybeth stands for Happy Girl. Beth grew up on a farm and according to the neighbors was always singing while riding her pony!